European steelmakers are reeling from a global glut and last week Luxembourg-based world leader ArcelorMittal blamed China for a colossal $8-billion (€7.1 billion) loss in 2015 while thousands of jobs are being cut. “We cannot allow unfair competition from artificially cheap imports to threaten our industry. I am determined to use all means possible to ensure that our trading partners play by the rules,” EU Trade Commissioner Cecilia Malmström said in a statement. The European Commission, the EU’s executive arm, had opened an investigation into imports of seamless pipes, heavy plates and hot-rolled flat steel from China, the statement said. The Commission separately imposed anti-dumping duties on cold-rolled flat steel imports from China and Russia. It recalled that it recently also imposed anti-dumping measures on Chinese steel bars used in the construction industry. Malmström last month urged China to cut output for everyone’s sake. “In the wake of a worrying trend, I urge you to take all appropriate measures to curb the steel overcapacity and other causes aggravating the situation,” Malmström wrote in a letter to Chinese Commerce Minister Gao Hucheng. The letter also warned China that it faced new probes if nothing was done after its steel exports soared 50% in 2015, destabilising the global market and the EU in particular. China accounts for half of global steel production but internal demand has slowed sharply along with the economy, forcing it to look overseas. Beijing has announced plans to cut production by as much as 150 million tonnes over the next five years but this is far short of the 340 million tonnes that experts say the country is overproducing every year. The latest measure on steel comes amid a growing stand-off between the EU and China, which are major trading partners but which have also had many trade disputes in the past, most bitterly over solar panels which continues to rumble on. In a separate statement Friday, the Commission said it was extending existing anti-dumping and anti-subsidy measures on imports of Chinese solar modules and cells via Taiwan and Malaysia. It said an investigation showed that China was getting around duties by transhipping the goods via Taiwan and Malaysia. Tensions with China have also grown as Beijing presses the EU to recognise it as a fully market-based economy, not a communist, state-controlled giant which now ranks second in the world only after the United States. China joined the World Trade Organization in 2001 as a developing country, a status giving it 15 years to progressively remove government controls. Beijing insists it has done just that and should now be recognised as a market economy but many in Brussels disagree. They say the change in status could mean they will have fewer options to control trade with a China they believe is still dumping exports on the global markets. Malmström’s spokesman Daniel Rosario said the EU currently had 37 trade defence regimes in force against imported goods and 16 of these involved Chinese products. Steel industry group Aegis Europe plans a march in Brussels Monday, expecting to draw several thousand people to a protest against China’s market-economy ambitions. The European Steel Association (EUROFER) welcomed the measures on Cold-Rolled Flat (CRF) products but criticised extremely low level of duties on Chinese steel imports. 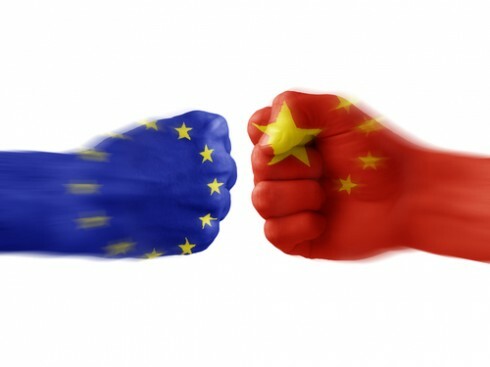 “If China were to be granted Market Economy Status (MES) by the EU, this would further undermine the effectiveness of the EU’s Trade Defence Instruments. Thousands of steel workers and their employers are accordingly marching on Brussels on Monday 15 February to call for fair trade and to put off the granting of MES to China until the country meets the EU’s criteria to be considered a market economy”, concluded Eggert. In 2008, the European Commission launched an investigation into imports of steel from China, South Korea and Taiwan, which European steelmakers have complained are being dumped on the market at below cost price, putting thousands of jobs at stake. The EU executive has opened a series of inquiries into alleged dumping from China in a broad range of industrial sectors. In 2012, it launched its largest investigation to date, into alleged dumping of, and subsidies for, an annual 21 billion euros of solar panels and components China exports to the EU. Beijing hit back immediately, by launching its own anti-dumping and anti-subsidy probe into European wine. In 2013, EU states agreed to impose duties on imports of Chinese plates and other table and kitchenware. In the telecoms sector, the EU executive is also investigating alleged subsidies to Huawei and ZTE – emanating from export credits given by Chinese banks – which the EU executive believes offer the Chinese companies preferential terms for investing into foreign markets. The EUdiots immediately resort to “illegal protectionism” when they can’t compete despite the repeated WTO rulings in China’s favour That’s not how you do fair trade. China has all the right to retaliate accordingly, and it will ! A recent research paper by labor economists David Autor, David Dorn and Gordon Hanson titled: “The China Shock: Learning from Labor Market Adjustment to Large Changes in Trade” show powerful evidence that industries and regions that have been more exposed to Chinese import competition since 2000 (the year China joined the World Trade Organization) have been hit hard and have not recovered. In the US increased trade with China caused severe and permanent harm to many American workers.